Posted on August 9, 2015 by Karatzas Marine Advisors & Co. In an effort to be more efficient and focused, from now we will report on this blog only pertinent transactions per market segment and asset class for s&p (sale & purchase market) that have occurred in the last couple of weeks. Transactions and transaction details in shipping are never as transparent and clear-cut as many an analyst or an appraiser may wish to think; having the benefit of time-lapse and fact-checking, we believe that reporting more accurately sales vs reporting them prompter is of greater service to our readership. Also, our reporting will be more structured by market segment and asset class going forward. 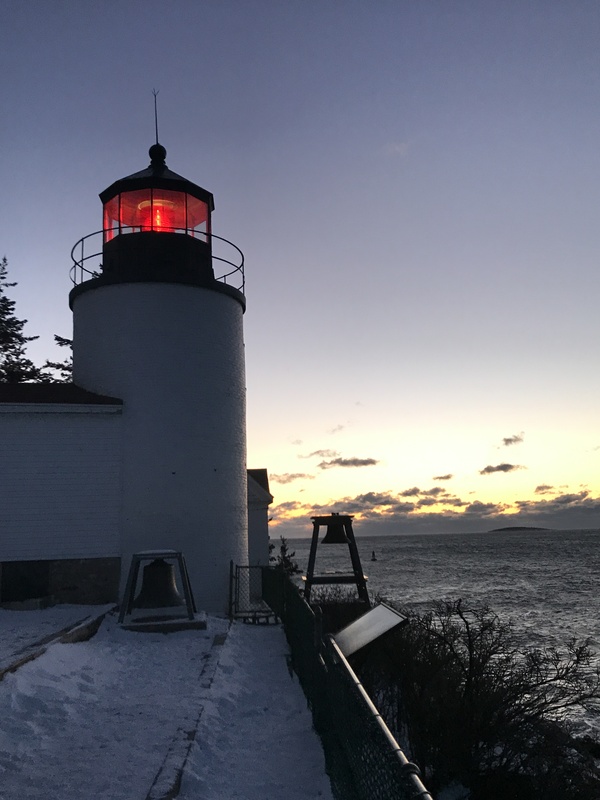 Transactions will be purely reported herewith; commentary on market conditions and trends, discussion on transactions and developments and their significance will be posted at our sistership blog, Shipping Finance by Karatzas Marine. Please feel free to subscribe! As always, shipbrokerage and shipping finance advisory is provide by our sponsor company, Karatzas Marine Advisors & Co. Despite the summer seasonality in the sale & purchase market, the market overall has been active; in the dry bulk market, there is no humongous volume of vessel sales, but the freight market has been improving ever so slowly since late spring, and many buyers (or at least interested parties) are trying to call the bottom of the market. There is increased buying interest and activity in terms of inquiries and vessel inspections – which does not always translate to transactions; interest nevertheless remains respectable. There have been concerns that some ‘hot’ buyers are outbidding the competition by a few hundred thousand dollars, but overall the market remains very disciplined. There is strong focus on modern and high quality tonnage, and always within certain price discipline; older- or lower- quality tonnage keeps receiving high opportunistic and sporadic attention only. 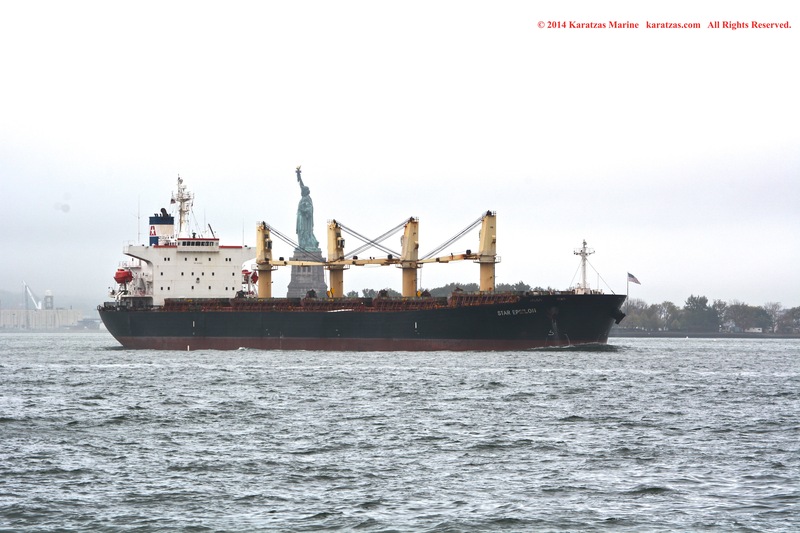 In the capesize market, MV ‘Churchill Bulker’ (179,000 dwt, Hyundai Heavy, 2011) was reported sold by Denmark’s Lauritzen Bulkers to Greece’s Marmaras Navigation at region $34 million. A week or so earlier, sistership MV ‘Corona Bulker’ (179,000 dwt, Hyundai Heavy, 2011) was reported sold at same terms from same sellers to same buyers. Lauritzen Bulkers had mentioned in the last year that they would be looking to divesting of their dry bulk assets, and thus they are carrying through with these transactions; on the other hand, Marmaras Navigation had mostly been pre-occupied with their tanker fleet, but since earlier this year they have been buying into the dry bulk downcycle. They have a very good name for timing correctly the market in the past, thus it will be interesting to see whether the recent build-up of their dry bulk fleet would add onto their reputation. Similarly-aged capesize vessel MV ‘Houheng 2’ (179,000 dwt, HHIC-Phil at Subic SY/Philippines, 2011) has been sold at less than $31 mil from her Chinese owners (Henghou Industries (H.K.) Ltd.) to undisclosed European owners; the marked down on pricing is clear compared to the Lauritzen sales, as buyers are extremely preferential for quality tonnage; it’s further understood that despite her age, MV ‘Houheng 2’ had to undergo extensive engine repairs last year, confirming buyers pre-occupation with tonnage with unblemished pedigree. Also similarly aged capesize vessel MV ‘Blue Cho Oyu’ (180,000 dwt, Daehan, 2011) was sold by S. Korean interests to Mano Maritime Ltd. (Israel) at $33.5 million, a strong pricing given the vessel’s pedigree. Resale newbuilding MV ‘Glory Max’ (Hull No Shanghai Waigaoqiao 1335, 180,000 dwt at Shanghai Waigaoqiao with 2016 delivery) was sold by Gleamray Maritime to clients of Coberfelt in Belgium at $44 million. Older sistership capesize tonnage MV ‘Raiju’ and MV ‘Kohju’ (173,000 dwt, NKK SB, 2000/2001, respectively) were sold from the Mitui keiretsu to clients of SwissMarine and Winning Shipping, respectively, at appr. 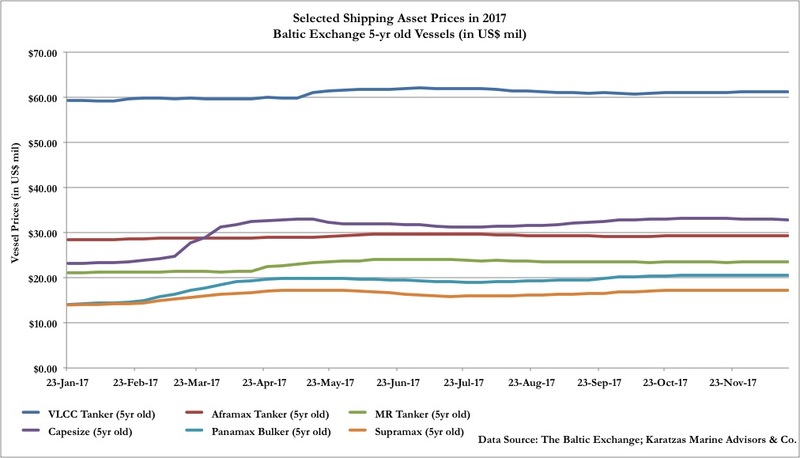 $9.7 million, each; prices achieved represent a precipitous drop from sale prices achieved just nine months ago, and it will be interesting to see how these two last transactions will play out for the buyers, given that pricing are just a premium to scrap but vessels have at least seven more years remaining economic life each. In the panamax asset class, the post-panamax bulker MV ‘Umberto d’Amato’ (93,000 dwt, Jiangsu Newyangzi/China, 2011) was sold to German interests at just below $15 million. Sistership vessels MV ‘WelHero’ and MV ‘WelSuccess’ (93,500 dwt, Jiangsu, 2010) were sold en bloc by South Far Ocean Group Ltd. to European interests at $28 mil collectively. Modern panamax bulker tonnage has seen increased buying interest with a series of transactions to report: MV ‘Asita Sun’ (82,000 dwt, Daewoo (DSME), 2012) at $20 mil to Greek buyers (Golden Union or Chandris) via bank sale; MV ‘Orion Pride’ (81,500 dwt, Hyundai Samho, 2011) at $19.7 million by Golden Bridge in S. Korea to undisclosed buyers (reported Golden Union in Greece); Golden Union has also been reported to be the buyer of a similar unit, MV ‘Bergen Trader’ (81,500 dwt, Sundong, 2011) by Nisshin Shpg.Co.Ltd. at appr. 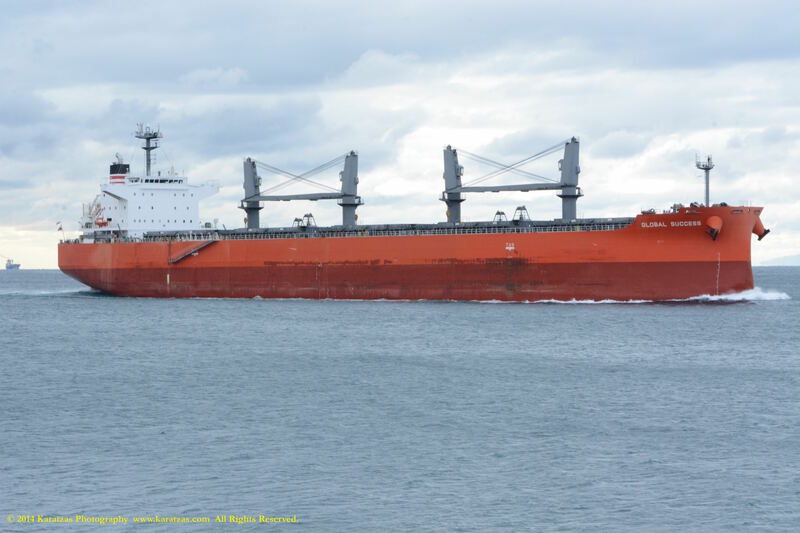 $19 mil; MV ‘Rainbow Ace’ (81,500 dwt, Guangzhou, 2012) at $16 million to Norwegian interests (Golden Ocean). There have been sufficient sales of ‘traditionally’ size panamax dry bulk vessels as well: MV ‘Luyang Rising’ (76,500 dwt, Yangfan, 2012) was sold to German buyers at a relatively soft price of $15.5 mil (but with intermediate survey promptly due). 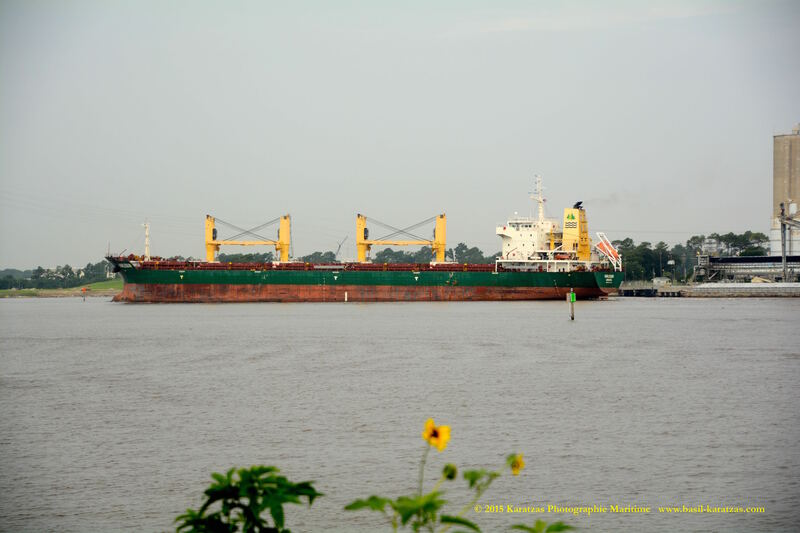 MV ‘Rondeau’ (77,000 dwt, Namura, 2006) was sold to Omicron Ship Management in Greece at $13.8 million. MV ‘Kanishka’ (76,000 dwt, Tsuneishi, 2005) was sold at auction in S. Korea at a low price of $11.5 mil to Greek buyers (Sun Enterprises); the vessel has been at lay-up for some time now, and buyers will have to spend some money to bring the vessel back to a trading condition, which reflects the softness in pricing. By comparison, similar vessel MV ‘Grace Future’ (75,500 dwt, Universal, 2006) was sold to Greek buyers (A.M. Nomikos) at a very respectable $13.3 mil. Moving on to older tonnage, MV ‘Mahitis’ (75,000 dwt, Hyundai, 2001) was sold to Korean buyers (KLC) at a reported price of $8 mil., while 1998-built in Japan MV ‘Star Natalie’ (76,000 dwt, Sumitomo, 1998) achieved scrap-related pricing at ca. $4.2 mil. On to the ultramax / supramax asset class, an interesting sale for M/V ‘Yangzhou Dayang DY216’ (63,500 dwt, Dayang/China, 2015) by Crown Ship Ltd. at ca. $22.5 mil to an institutional investor in the U.S. (Raven Capital); after many funds were burned, there have been no sales to institutional buyers in a long while, thus the transaction stands out; it also stands out for the institutional investors’ preference buying ‘cheap ships cheap’, which it has not been of great investment success strategy, at least so far. MV ‘KT Condor’ (58,5000 dwt, Tsuneishi Zhoushan, 2011) was sold by Kambara Kisen at ca. $14.5 mil to Greek buyers (Kondinave). 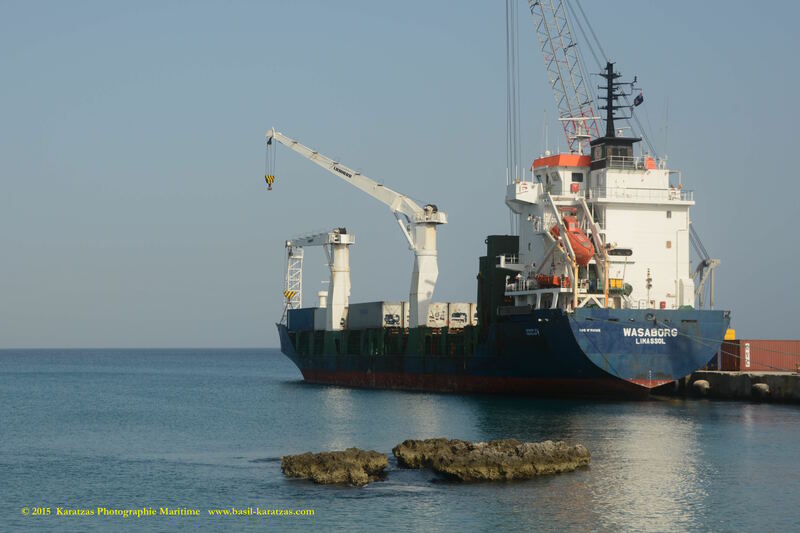 Similarly aged MV ‘Daxia (57,000 dwt, 2011) was sold at auction in Malta at $11.5 mil (understand that the vessel has been at lay-up for several months now, thus, besides the auction discount, there is also the costs associated with bringing the vessel back to trading condition.) Marmaras Navigation has also been active in the supramax market with the acquisition of two sisterships MV ‘Hanjin Albany’ and MV ‘Hanjin Rostock’ (55,700 dwt, Hyundai-Vinashin/Vietnam, 2011) at a lowly $13 mil each. MV ‘Nord Reliable’ (58,500 dwt, Tsuneishi Cebu, 2008) by P&F Marine achieved $13.8 mil to clients of Sea Globe. For older tonnage in the sector, MV ‘Medi Osaka’ (53,000 dwt, Oshima, 2003) was sold by Nisshin Shpg.Co.Ltd. at $7.8 mil., while the also Japanese-built supramax MV ‘Olympias’ (53,000 dwt, Onomichi, 2001) was sold at a bank-driven-transaction at $7.2 mil. by Petrofin to other Greek buyers. Similarly, MV ‘Speedwell’ (50,500 dwt, Kawasaki, 2003) was sold by Misuga Kaiun Co. Ltd to Greek buyers (DND) at ca. $7.8 mil. The transactions reported above have taken place within the month of July, and it seems to be a rather decent volume of business. However, one has to take into consideration that July has been the best month the dry bulk freight market has seen in a while, thus there had been some pent-up interest; also, although there has been certain price improvement since out last report, there is little real news to send home. Besides, several of the transactions mentioned above were for vessels at lay-up, and/or at auction, and/or driven by banks, and several of the Japanese sales were for reasons beyond market considerations, thus not a great deal of ‘voluntary’ trading volume. As a matter of hopeful thinking, the graph herebelow depicts the Baltic indices since the market bottomed in early spring. Just think positive, enjoy the hopeful chart, and do not let sinister thoughts disturb skin-dipping in your favorite waters in the summer! 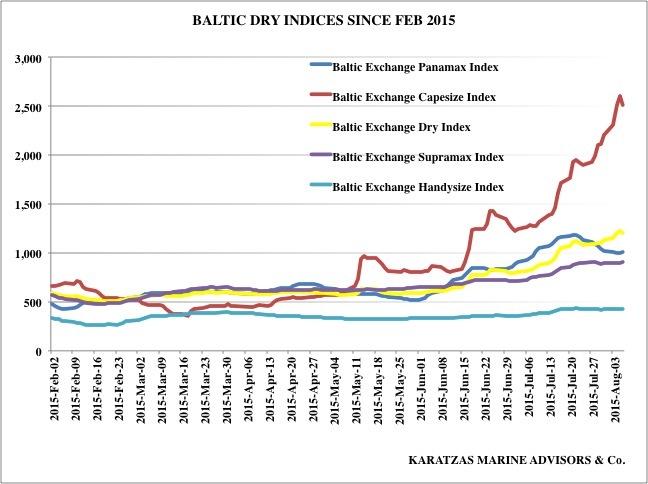 Baltic Indices since February 2015. Posted on March 22, 2015 by Karatzas Marine Advisors & Co. The last couple of weeks have brought the slimmest hope that springtime may be forthcoming for the much beleaguered dry bulk market; we are not talking about signs of an impending great recovery, but at least the dry bulk indices have stopped dropping and have shown marginal improvement; the widely-observed Baltic Dry Index (BDI) established an all-time low point on February 18th at 509 and closed at 591 on Friday March 20th; on percentage terms the improvement seems impressive (close to 20%), but again one has to keep in mind that the low of 509 was a thirty-year low – almost, and despite the improvement, dry bulk vessels are earnings below cash break even rates – thus, the improvement is not financially meaningful; it only bears psychological significance that hopefully the worst is behind us, for now. As one would expect, publicly listed dry bulk companies continue to report abysmal earnings (actually losses), and earnings conference calls tend to range from confessionary litanies to Christmas lists on what would turn the market around. There have been the occasional corporate bankruptcy here and there and some ship arrests on a limited basis but nothing of a Korea Line Company (KLC) magnitude shockwave. Likely another blowup the size and significance of KLC will not materialize in the dry bulk market as KLC had taken shiploads on vessels at sky-high rates prior to 2008 while most of the traders / charter-in operators today have established their cost floors and rates at substantially lower rates in 2012 to 2014. While the dry bulk handysize, supramax and to a lesser extent panamaxes were slowly improving for a couple of weeks now, capesize vessels are kept on a freight declining route; only this week capes bounced from a low of 357 points to 423 points in a matter of two days, generating suspense for the coming week whether the freight rates will keep moving higher. It may be so, and it will be most welcome news; however, over the longer term, capesize tonnage likely will have a tough ride: the Chinese economy has both been slowing down and also getting shifted from industrial production to consumption which does not bode well for iron ore imports and the cape market; further, China has been producing (and storing) much more steel that can use and recently there have been talks of China dumping below cost steel to the international markets raising the prospects that the World Trade Organization (WTO) may be asked to look into the complaints; the fact that mining companies have been building up their own captive fleets and that Vale managed to find a resolution with China and Cosco for their so-called Valemax fleet is not boding well for the overall capesize market and the independent owners. A boost to the capesize market is much needed and hoped for, but on the long term, one has to be skeptical of too rosy prospects. In terms of sale & purchase activity in the dry bulk markets, at present, actual activity is low; there is lots of ‘browsing’ and ‘interest‘ for buying quality vessels but little of such interest is translated to actual transactions; buyers are trying to find a ‘balance’ of not buying too early when bulkers can further drop in pricing, but, on the other hand, they do not want to miss out when the market recovers; it seems a patience search of the absolute bottom in asset prices is the name of the game. Few transactions can be reported in the dry bulk market and mostly for small, older, cheaper vessels (in absolute terms); given the lack of benchmark transactions is hard to place an accurate estimate of asset price decline; however, the trend is apparent that based on the transactions reported the market keeps heading lower. In the capesize market, the sale of MV „Cape Stork” (171,000 dwt, IHI, 1996) was reportedly at close to $7.8 mil, a scrap related price level; interestingly, the vessel was sold in November 2014, less than six months ago, at excess of $15 mil, implying that the buyers’ bet then on a seasonal recovery for capes during the holiday season has not played out as expected. In another interesting transaction in the sector, Oaktree has sold at $80 million apiece two VLOCs MV „Selma B“ and MV „Camilla T” (320,000 dwt, HHI, 2010/ 2011, respectively) to Olympic Shipping (Onassis Group) to be converted to VLCCs; Oaktree was involved with the vessels during the restructuring of Nobu Su’s TMT (Today Makes Tomorrow); during the last year, the Onassis Group has shown to be an active buyer of tonnage, primarily in their historically beloved tanker market; however, the pricing for these vessels seems to be too strong given the costs, risks and ‘hair’ involved for the conversion project, not mentioning the concern that typically converted vessels do not seem to get special attention for the remaining of their trading lives by the charter market. In the panamax bulker market, the post-panamax bulker vessel specialized for the coal trade MV „Sekiyo” (91,500 dwt, Hitachi, 1998) was sold at close to $9 million to Chinese buyers by Nippon Yusen Kaisha (N.Y.K. Line); the price is at premium of a couple million to scrap pricing, which is the norm these days for tonnage built prior to 2000. In the same sector, MV „Lopi Z” (72,000 dwt, Shin Kurushima, 1998) was sold to Norwegian investors in a sale-and-lease back transaction from Dalomar Shipping in Greece at approximately $6 mil, a purely scrap related price. The supramax market has proven the most active in the dry bulk market, with the sale of MV „C.S. Rainbow” (55,700 dwt, Mitsui, 2006, 4x30T cranes) at $11.25 mil by Japanese sellers to Greeks buyers (Blue Seas). The sale seems to be well below the price achieved by same sellers of similar vessel MV „Sunny Ace” (55,800 dwt, Kawasaki, 2005, 4x30T cranes) at $11.3 mil one month ago (vessel was also SSDD due.) Looking further back in January, when MV „VERDI” (2007, 58,500 DWT, Tsuneishi Zhoushan) was sold at $15 mil, the trend in supramax bulker pricing is clear. It’s really very hard to comprehend that ten-year-old supramaxes were selling at more than $60 mil in the spring of 2008 and at $22 mil just one short year ago; now we are talking about $10 – $11 mil for a ten-year-old vessel. The ten-year-old handymax MV „Ramada Queen” (46,000 dwt, Oshima, 2005) with drydock due sold at an eye-popping price of $8.7 mil to Greek buyers (Primal). The older handymax MV „Valopoula” (45,500 dwt, Tsuneishi Cebu, 2000, 4x30T) was sold at a respectable but still scrap related pricing of $6.1 mil to Greek buyers again (Dianik Shipping) with drydosck due. The smaller and meaningfully older handymax MV „Bay Ranger” (43,500 dwt, Oshima, 1995, 5x25T cranes) was sold at appr. $4.5 mil with the vessel recently having been drydocked (present estimated scrap value of about $3.1 mil at 7,350 ldt.) The similar vessel MV „Hellenic Horizon” (44,800 dwt, Halla, 1995), 4x25T cranes) was sold at a scrap related $3.7 mil – with drydock promptly due. As one can note, recent transactions in the dry bulk sale & purchase market resemble rather a scrap report, with vessels sold between 10-20 years old and no modern tonnage to report on, drydock position and estimated scrap price always as points of reference. And the prices achieved resemble prices for vessels selling for scrap rather than further trading, another indication that buyers opt to act only when there is little downside risk with their acquisitions, either with vessels with 5+ years of trading life at scrap pricings on a minimal pricing over scrap and drydocking for vessels having a decent survey position. Can things get more difficult? Posted on March 9, 2015 by Karatzas Marine Advisors & Co. Unlike the dry bulk market which is experiencing a multi-cycle structural weakness, the tanker market has been behaving much more enthusiastically, at least for time being. Tanker vessels have been trading above operating earnings since early 2014, and on occasion, for spot rates, earnings have been eye-popping – such as when in January 2015 rates for VLCCs flirted with the $100,000 pd mark. 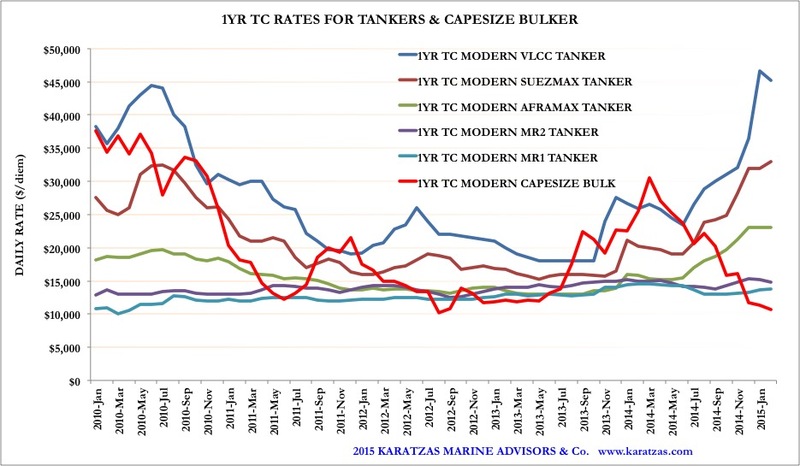 The attached graph shows one-year time-charter rates for the major segments in the tanker market, including the capesize market, for purposes of illustration and comparing tanker and dry bulker markets; and an obvious reminder, capesize vessels are the largest commoditized bulker vessels in the business. Crude oil pricing has grossly halved in the last year, and OPEC’s (read, Saudi Arabia’s) decision in November in Vienna to go after market share rather than margins has ensured that at least in the short term, oil will be cheap and likely will be trading heavily. Cheaper crude oil pricing has the potential of contango (buy now in the physical market, store – ideally on tankers – and sell in the futures market at a higher price); cheap oil pricing has the prospect of increasing demand (there are already signs that sales of SUVs and trucks are on the up in the USA) that eventually will mean more movement of cargoes; cheap crude oil has been encouraging build up of strategic petroleum reserves, and there are indications that China is going strong at building up theirs under the weakness of the pricing of the commodity. A brutal winter in the USA has stimulated the use of gasoline which has affected positively the petroleum products trade in the Atlantic. Despite the shutting down of many drills in the US for shale oil production (down by 39% from 1609 to 986 operating drilling rigs between October and end of February, according to Baker Hughes), the US maintains sky high inventories of WTI crude oil (for the week ended on February 27th, US crude oil inventories showed a massive weekly build-up of 10.3 million barrels to a total of 444.4 million barrels); if not for the shale oil production, the seasonal impact of the inhumane winter would have a much pronounced impact on the crude oil tanker market. The strength of the tanker freight market has stimulated increased dealing in the sale & purchase market, but mostly it has encouraged several ‘corporate’ transactions whether on the M&A front (Euronav acquiring the Maersk VLCC fleet, the ‘merger’ of the Navig8 VLCC fleet with General Maritime to create Gener8, DHT’s acquisition of Samco Shipholding’s VLCC fleet) and on the IPO front (earlier this year Euronav was successful finally obtaining a public listing in the US). While more M&A in the tanker market may be expected, IPOs can be a trickier market, as investor appetite can gyrate faster than the fortunes for freight for big tankers. There is increased interest to see how a few of PE-sponsored tanker shipping companies will proceed in this environment, which while promising, it does not allow for these companies to float at a profit – indicatively, both Diamond S. sponsored by Wilbur Ross and Principal Maritime sponsored by Apollo – have relatively high cost basis and a floating at NAV will result in realizing losses, at least in the short term. Investor interest, and also charterer interest, in the tanker market – despite the market’s strength – have been of concern to many a shipowner. For instance, while the spot market is very respectable, there is no period market – in general – as charterers prefer to pay up spot prices now but not willing to commit for a two-year charter. This observation does not bode well for the future of the market, when charterers do not have the conviction to commit for two years of rates – in hot markets or markets expected to break out, charterers want to act and cap their exposure. Likewise, the activity in the secondary market has not been as active as the freight market would suggest; of course, banks do not lend easily these days, thus this is a dislocation affecting overall activity in the market. And the freight market is not as strong to support modern tonnage for operating expenses (OpEx) and a fully amortizing loans; by revisiting out graph at the top of the page, one-year TC for a modern VLCC is appr. $45,000 pd; given a nominal price of a VLCC tanker of approx. $100 mil. and approx. $9,000 pd OpEx, the earnings barely cover a fully amortizing ship mortgage. And, sale and purchase activity has overall been anemic – despite the strength of the market; and it’s clear that the focus of the transactions has been concentrated on modern vessels [typically vessels newer than five years old – suitable for publicly traded companies that are ‘hot’ for deals in this market and pay with equity (thus low leverage / more flexibility with cash flows), and vessels older than twelve years old at often prices at a multiple of scrap – by Asian buyers or buyers with access to cargoes]; these typically are not signs of a very liquid, solid market that has consolidated and about to break out; not to mention, that now that the freight market has improved, there have been packages of very modern tanker tonnage discreetly mentioned for sale, primarily from ‘OK’ owners or ‘OK’ / Chinese yards who are testing the market to offload positions at a small loss or at a break-even; once again, an indication of little faith in the prospects of the market, albeit from ‘weak hands’ or ‘OK’ quality tonnage with little prospects to be much sought after in the future. On indicative purposes, since the beginning of the year, the following representative transactions have taken place: in the VLCC market, MT „Patris” (298,500 DWT, Daewoo, 2000) was sold by Chandris (Hellas) in the UK to clients for Modec for FPSO conversion at the relatively very strong price of $38 million; similar vessel, MT „GC Haiku” (299,000 DWT, Hitachi Zosen, 2000) was sold at $31 million by GC Tankers to New Shipping; the three-year newer MT „DS Voyager” (309,000 DWT, Samsung HI, 2003) was sold by DS Tankers to NG Moundreas in Greece at $42 million. In the Suezmax tanker market, in 2015 so far, there has been only the sale of two sistership vessels MT „Chapter Genta” (156,000 DWT, Jiangsu Rongsheng, 2010) and MT „Roxen Star” (156,000 DWT, Jiangsu Rongsheng, 2009) at $96 mil from Roxen Shipping to interests controlled by Frontline / Fredriksen Group. Likewise in the aframax tankers, Teekay Offshore has disposed of the shuttle tanker MT „Navion Svenita” (106,500 DWT, Koyo Dock, 1997) at an undisclosed price; MT „Sark” (113,000 DWT, New Times SB, 2009) has been sold by Sark Shipping to EA Technique at $40 million. In the LR1 tanker market, Prime Marine of Greece has sold four LR1 tankers to Hafnia Tankers in Denmark at an undisclosed consideration; the vessels were MT „Arctic Char” (75,000 DWT, Brodosplit, 2010) and the sisterships MT „Karei”, MT „Kihada” and MT „Maguro” (74,250 DWT, STX SC (Jinhue) 2010). The MR2 product tanker market has been more active with the sale of sistership tankers MT „Caletta” and MT „Calafuria” (51,500 DWT, Hyundai Mipo, 2011 / 2010, respectively) by G. D’Alesio in Italy to interests at $30 mil each. For pumproom design vessels, Minerva Marine of Greece acquired MT „Nord Obtainer” (47,500 DWT, Onomichi Dockyard, 2008) at $19.50 mil, while similar tonnage vessel was sold to clients of Benetech in Greece at the comparatively high price of $23 mil for MT „Nord Star” (45,900 DWT, Shin Kurushima, 2009) from Saito Kisen. MT „Hellas Symphony” (46,200 DWT, Hyundai Heavy, 2000) was sold by clients of Latsco in the UK at $10.5 million, while similar tonnage MT „Tosca” (47,500 DWT, Brod. Trogir, 2004) was sold at $18 million. The 1997-built tanker MT „Midnight Sun” (45,000 DWT, Minami Nippon, 1997) was sold from Mitsui OSK Lines in Japan at $8.0 million to Far Eastern interests. There has been an interesting sale of an MR1 tanker, MT „HC Elida” (37,500 DWT, Hyundai, 2001) at $11.5 million by Marlink Shif. in Germany to Far Eastern interests, showing relative strength for this under-the-radar tanker segment. There have also been a few transactions in the usually quiet market for stainless steel tankers, such as the sale of MT „HF Pioneer” (19,900 DWT, Fukuoka SB, 2010) by Fairfield Chemical in the US to clients of Heung-A at $25.25 million. The also stainless steel tanker MT „Fairchem Colt” (19,900 DWT, Usuki Zosensho, 2005) by Tanba Kisen to S. Korean interests at $19 million. The older stainless steel tanker MT „ST Dawn” (19,900 DWT, Shin Kurushima, 2000) was sold by Stalwart Tankers at $14.5 mil to clients of TPL Shipping. The IMO II/III epoxy-coated tanker MT „Sichem Onomichi” (13,000 DWT, Sekwang, 2008) was sold at $11 million by Hisafuku Kisen K.K to S. Korean interests. Once again, despite the fairly encouraging freight market, rather few transactions have taken place in the secondary market for tankers, and mostly for tonnage either newer than five years or older than twelve years. And keeping accounts for newbuildings, eleven VLCC tankers have been ordered in 2015, twelve orders for Suezmax tankers and fifteen orders for Aframax tankers, and four MR tankers have been placed. All in all, TWO WHOLE VLCCs were scrapped so far this year, and zero scrappings in the rest of the tanker segments mentioned in this report, for a NET GROWTH of the world tanker fleet. It seems that staying away from NBs and more orders for tonnage is hard to do… And, a quick remark on the demolition market that has dropped by 20-25% since the beginning of the year, given the weakness of the dry bulk market and plenty of vessels offered, thus driving supply up and prices lower, admittedly from speculative rates well in excess of $500/ldt at the beginning of this year. Posted on December 25, 2014 by Karatzas Marine Advisors & Co. 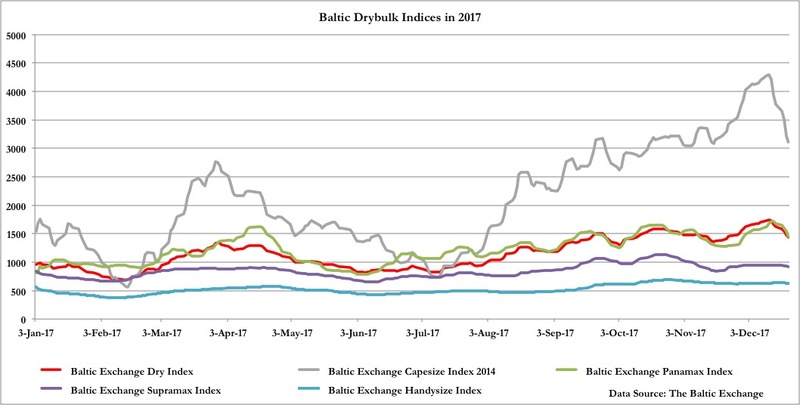 Since our last report at the end of September, the overall dry bulk market has dropped by more than 25%; however, when the decline is seen from the interim peak in early of November at 1,484 points to the present reading of 788 points, for the BDI, the index been cut in half (Graph 1). The capesize market as always has been the most volatile component of the BDI index, and it has been on a free fall from the top of 3,781 points on Nov 4th to 474 points on Christmas’ Eve, equating to less than $5,000 pd in terms of freight rates. 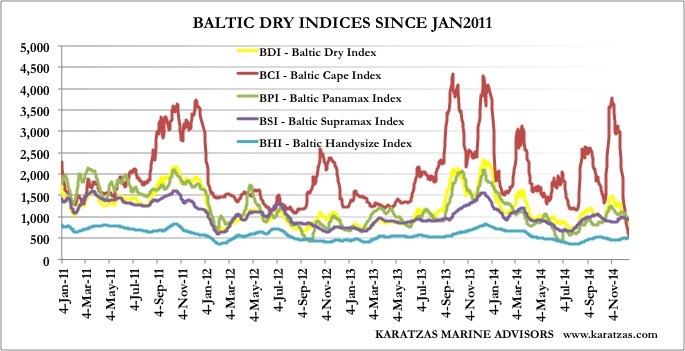 Looking back, it was in late fall 2013 when the capesize index was trading at comparably high levels (as high as 4,500 points on an occasion), but 2014 has not been a good year for the dry bulk market overall. 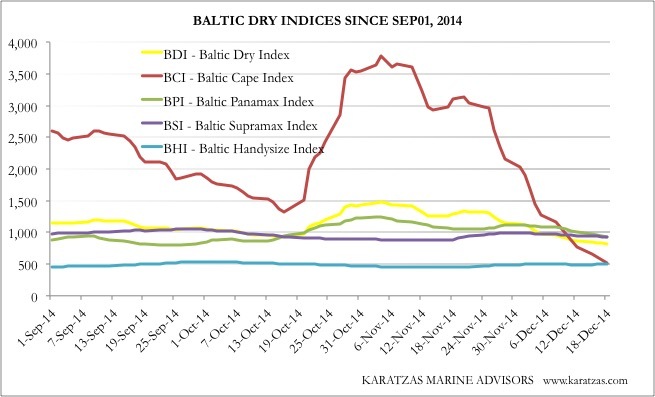 The performance of the dry bulk market in 2014 got many market players by surprise, as the consensus thinking had been that the market had found bottom in 2011 and 2012, and since then the trend was expected to be upwardly leading, only the degree of the positively sloping line was a matter of debate. The performance of the dry bulk market has been having a major impact on market activity, both directly and indirectly. For starters, cash flows have been at or below operating levels, thus dry bulk owners have been bleeding cash from running their dry bulk vessels, which obviously is not a good result. Further, given that dry bulk vessel ownership is much wider-ly spread (than let’s say tanker vessel ownership), the pain of negative cash flows is widely felt, affecting many, many owners in absolute terms, financially; and when the cash register of a great deal of owners bleeds cash collectively, momentum and attitude are negatively impacted, thus turning the mood of the overall market sour. Again, the consensus thinking has been that 2014 ought to be a good year and many players had placed accordingly ‘long bets’, thus the negative performance has an amplifying effect on a wide range of prospects from newbuilding orders placed on the assumption of an asset play game (surprisingly, no financing in place for many of these speculative orders) to companies having prepared for IPOs and access to the capital markets, to private equity (PE) funds expecting on building a positive track record with an eye to a quick and profitable exit strategy. 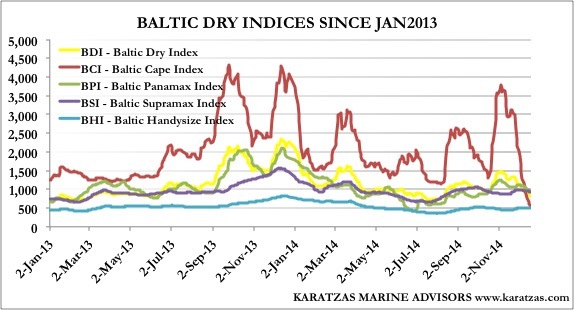 The dry bulk index started the year in an active way with the tailwinds of last year, and until the middle of spring 2014 (Graph 2), the prospects were looking up; by partying time at Posidonia in June in Greece, the dry bulk market was more than a couple of months in decline; however, owners having built cash reserves during a strong 2013, were holding high hopes and were thinking of bridging the seasonally weak early summer and start trading strongly at the end of the summer. The summer came and left, the fall came and left, and the year came and left, and still no rally to be seen. No predominant cause for the failure to appear for the market rally, but pointers abound: a) for once, world economic growth prospects have been getting revised lower, from the Japanese economy entering recession and the European economy flirting with one too, b) the Chinese economy downshifting seriously on the back of calls for clean air (i.e. burning less coal) and cleaner business policies (i.e. going hard after corruption and self-dealing) and lowering inventories, c) new or stricter export requirements of commodities by several countries (grains in Argentina, mineral export duties in Jakarta) and neutral shipping trends despite a bumper crop harvest in the US, while d) vessel supply kept increasing (approximately 620 dry bulk vessels were delivered in 2014 y-t-d, 320 were scrapped in the same period for a net increase of more than 3% on a world fleet of about 10,000 dry bulk vessels at the beginning of the year). Despite the fact that hope springs eternal in shipping, dry bulk asset prices has been shifting lower as well. Financing is still hard to find for most shipowners and with freight rates low, potential buyers want to see compelling opportunities to get enticed to open their wallet. In our business practice, we often see buyers’ typical reaction to proposed sale candidate vessels: “the market is at $X mil as per ‘last done’ for this vessel and we would never buy at market, but we would consider offering at market less 5-10%”, which approach has been chipping lower on prices from previously done price levels. While earlier in the year prices were moving in tandem for modern and older dry bulk vessels (usually, independent and smaller owners buy ‘older’ vessels and shipowners with access to the capital market prefer modern tonnage, as a rule of thumb), as of recent, there is a bifurcation in the market as modern vessels have been holding better their prices while ‘older’ vessels have seen a more pronounced drop in asset pricing. It’s hard to pinpoint the widening of the gap between older and modern tonnage, but access to funding and capital markets (where also fees are much higher, and also where there is the need of ‘deal pressure’ and also the need to ‘feed the beast’) may partially explain the price differential. A partial explanation may also be attributed to the strength of the US Dollar (and / or the weakness of the Japanese Yen) which have made the sale of Japanese-controlled vessels more palatable – and, indeed, we have seen more Japanese controlled tonnage for sale in the secondary market in the last few months. In the capesize market, we have recently seen the sale by Daichi Chuo of MV ‘First Eagle’ (170,000 dwt, 2010, Imabari Shipbuilding) at approximately $41 million to Chinese buyers. In middle November, Daiichi Chuo again disposed of another larger-sized bulker MV ‘First Ibis’ (180,000 dwt, 201, Universal S.B.) at $45 mil to same buyers, clearly indicating that the price of ‘First Eagle’ is a meaning step-down in pricing, after adjusting for size. As a matter of comparison, Daiichi Chuo again sold another capesize vessel in April this year, MV ‘Shanganfirst Era’ (181,000 dwt, Koyo Dock K.K, 2010) at approximately $54 mil to Greek buyers (Golden Union), which makes clear the asset pricing trend between spring and fall this year. Just recently, publicly listed Diana Shipping announced the acquisition of a 2015-built vessel at $50 mil (Hull No BC18.0-51, 180,000 dwt, Beihai Shipyard, 2015); interestingly, Diana also announced this week in a press release the chartering of one of their 2010-built capesize vessels MV ‘New York’ (177,000 dwt, SWS, 2010) to Clearlake for a period of 14-18 months at $12,850 pd less 5% commissions – it would seem that there is still a big disconnect between asset pricing and freight market, unless there is strong conviction for a market recovery. Back in November, Alpha Tankers and Freighters of Greece acquired from Lauritzen Bulkers the vessel MV ‘Cassiopeia Bulker’ (180,000 dwt, Hanjin H.I., 2011) at approximately $42 mil, while at around the same time financially oriented CarVal Investors acquired MV ‘Mineral Manila’ (180,000 dwt, HHIC-Phil., 2011) at $43 million from Bocimar. As an indication of the present market bifurcation, Turkish interests acquired MV ‘Pacific Triangle’ (185,000 dwt, Samsung, 2000) at close to $17 mil, approximately $5 mil premium over scrap price for a vessel likely to have 5+ years remaining economic life. The panamax dry bulk market has been experiencing a tough cycle, with very weak rates and many existential questions of the optimal size of a ‘panamax’ vessel in our modern world. In any event, just this week, publicly listed Scorpio Bulkers announced the sale of 81,000 dwt vessel at $30.5 mil to Vita Management in Greece (Hull No 164, Tsuneishi Zhoushan, 2015) – incidentally, this week also Scorpio Bulkers announced the scuttling of a six-vessel capesize order (for the newbuilding orders to be converted for coated aframaxes to be sold to sistership company Scorpio Tankers, another implicit sign of the sorry state of the dry bulk market). Earlier this year, Mitsubishi Corp. sold three post-panamax vessels to Golden Union in Greece at prices reported at approximately $34 mil (Hull No 1623 / MV ‘King Santos’ / MV ‘King Seattle’ 81,000 dwt, STX SB (Jinhae), 2014), making clear the asset price trend since the spring of this year for this asset class (appr. 10% decline). K-Line sold the panamax bulker MV ‘Opal Stream’ (77,000 dwt, Oshima S.B., 2003) at $13.5 mil to BulkSeas, while Daiichi Chuo – still an active seller – sold the vessel MV ‘Mulberry Wilton’ (77,000 dwt, Tsuneishi Zosen, 2004) at $14.5 mil to Greek buyers. As a matter of market trend, back in February 2014, Euroseas acquired the Japanese (Nisshin Shipg. 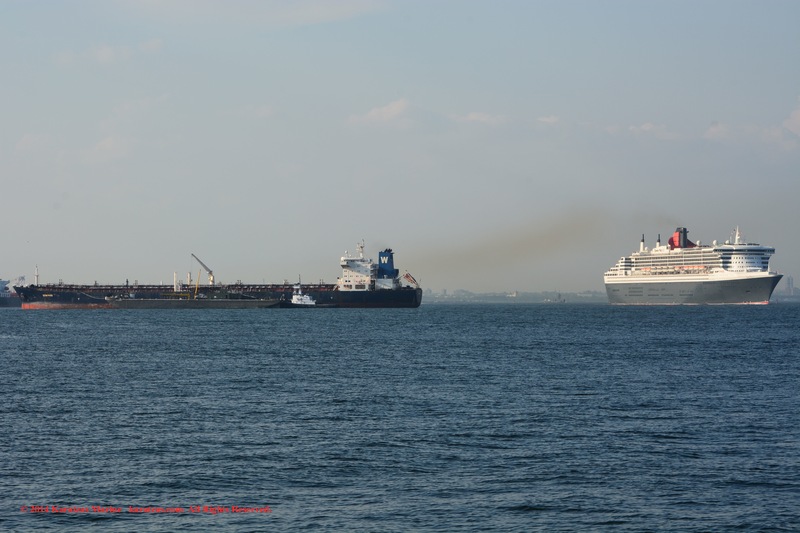 Co.) bulker MV ‘Million Trader II’ at $22.0 mil (77,000 dwt, Tsuneishi Zosen, 2004). In the handymax / supramax / ultramax markets, the prospects have not been much rosier; there has been a great deal of concern about the outstanding orderbook in the sector, although the economics at present are better pari passu to other asset classes: the freight revenue line is as bad as for bigger vessels but at least the costs basis is of a smaller scale. Crown Shipping sold recently to Ocean Agencies two prompt resales (Hull Nos ZJB-401/-402, 63,000 dwt, Sinopacific, Zhejiang, 2015) at $27 mil, each. In late spring, Da Sin Shipping sold the memorably-named MV ‘Mandarin Wisdom’ (63,500 dwt, Jiangsu Hantong H.I., 2014) at close to $29 mil to Erasmus Investments; at the beginning of 2014, in January, Greek interests acquired MV ‘Dietrich Oldendorff’ (63,500 dwt, Sinopacific Dayang, 2013) at $32 mil; the down-slopping asset trend is obvious since the beginning of the year. Again, Daiichi Chuo has sold MV ‘Sansho’ (55,800 dwt, I.H.I., 2012) at $24.5 mil to European interests; similarly, Japanese-based Noma Kaium sold MV ‘Ruby Halo’ (58,000 dwt, Tsuneishi Cebu, 2011) to First Steamship for $27 mil. 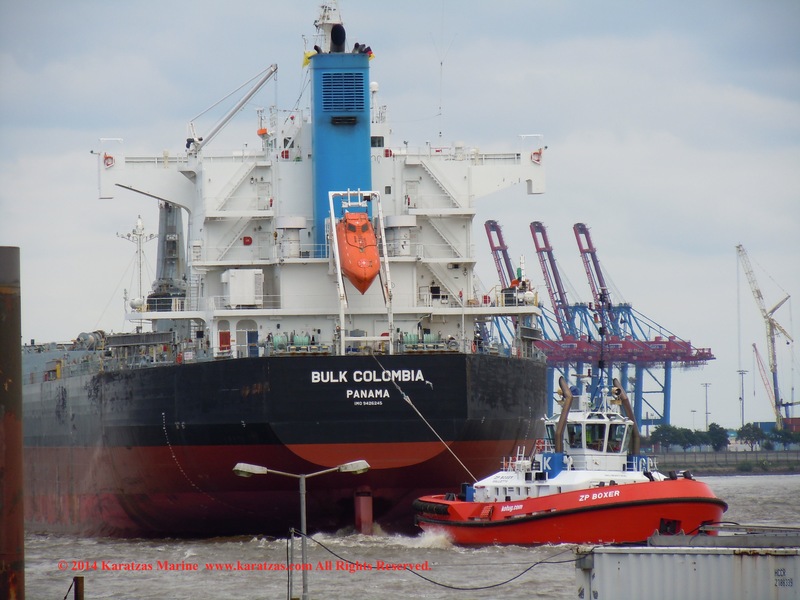 For ‘older’ vessels in this sector, K-Line again has recently been active with the sale of MV ‘Mokara Colossus’ (55,800 dwt, Kawasaki S.B., 2006) at $14.5 mil to (again) BulkSeas; British Marine sold MV ‘Gwendolen’ (50,250 dwt, Mitsui Shipbuilding, 2004) at the respectable $14 mil to Gurita Lintas; similarly, LT Ugland Bulk sold MV ‘Emily Manx’ (47,000 dwt, Shin Kurushima, 2001) at $10.25 mil, almost as much as Orient Marine Co. fetched for their MV ‘Pax Phoenix’ (50,250 dwt, Mitsui Shipbuilding, 2001) to Bangladeshi interests. Based on these recent transactions reported, one notices the nature of the sellers (Japanese, predominantly) and the shipbuilding origin of the vessels (Japanese, predominantly again – as there is little tolerance in this market for low quality tonnage); the nomenclature of the sellers re-affirms our earlier comment on FX rates and asset market drivers. In the handysize market, prominent transactions include the sale of evocatively named MV ‘Brilliant Moira’ (28,500 dwt, I-S Shipyard, 2014) by Aono Kaiun K.K to Greek interests at $18.10 million, and the sale of MV ‘Hudson Bay’ (29,500 dwt, Shikoku Dock, 2011) at $18.4 mil to Dalex Shipping in Greece by Mitsui Warehouse; same sellers have disposed of older vessel MV ‘Durban Bulker’ (32,500 dwt, Kanda S.B., 2005) at $13.5 mil to Taylor Maritime. Phoenix Shipping & Trading has sold the vessel MV ‘Porto Maina’ (18,700 dwt, Yamanishi Zosen, 2008) at $8 mil to European interests. Again, Japanese-originating names dominate sellers and shipbuilders nomenclature. Volume of transactions overall has been decent and, overall, it’s only marginally lower than 2013 when it was a better market overall. As expected, the beginning of 2014 was more active in terms of transactions, and with the passing of time and asset price declining, volume has been tapering off as well. While overall since 2011 the dry bulk freight market has been improving (Graph 3), the market has been moving within a ‘trading range’, between 1,000 and 2,000 points for the BDI – with the Cape market more ‘expressive’ and reactive, primarily to rhythms from China.